Leadwerks Game Engine is the easiest way to make 3D games. Learn everything you need with our comprehensive tutorials. Build games with the world's most intuitive game development system. Publish to Steam Workshop and show your game off to the world. MGE is a home brewed fully features game engine written in C++. It implements Python scripting, animation, physics, network, GUI interface, sound and many more features. 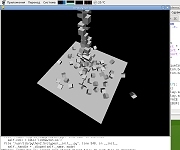 Site containing some advanced demos and applications for the Newton Game Dynamics Engine. It also has several developer demos with complete Delphi sources. A plugin for Animation:Master from Hash. Inc using the power of Newton for simulating physics. Newton Wrapper for Blitz3D is an inexpensive commercial wrapper of Newton Game Dynamics for Blitz3D. It integrates a significant set of the core functionality of Newton. oxNewton is a set of delphi visual components compatible only with GLScene opengl. All objects are ready to use and you only need to load a mesh or set the visual material for the objects. Power Render is a general purpose 3D Software Development Kit, intended for C++ programmers on the Windows platform using DirectX 9. The 3D engine can be used for virtually any 3D application, including games, screen savers, commercial visualization, character animation, and more. PPIsaac is an OOP wrapper of the Newton Game Dynamics engine and is especially designed for 2D game environments. This module offers you all the power of the Newton engine in your BlitzMax application. Newton 2.0 bindings for the Python language. Simon Sadler of October Tide ltd.
has been developing the "Newton For Quest" plug-in for quite some time now and we were very pleased with the results. Fortunately we were able to transfer the project to Quest3D so we can provide this great physics engine to our users without any additional licensing. all from physical joints and bodies, and then test them, throw them around, break them, before saving to file and loading into your own game. SketchyPhysics is a plugin for Sketchup. It combines a simple and easy to use interface with the power of a fast and accurate physics library (Newton SDK). TV3D boasts built-in physics powered by Newton Game Dynamics, complete with joints, interaction materials, events, ragdoll, and vehicle support. With the ability to control the precision of the solver, choose the fricton model, and set your own time-steps you have full control of the physics simulation. This page contains support material of the paper "Evolution of Prehension Ability in Anthropomorphic Robotic Arm" submitted to the "Frontier to Neuro-Robotics". In particular, we provide an exaustive list of video showing the robot in action. Newton Game Dynamics is used for simulate accuratly the dynamic of the world and the robotic arm. This thesis presents the design, development, and implementation of an intelligent agent capable of solving a physical puzzle. The puzzle is a three dimensional maze in which a marble must be moved from its starting point to a target cell in the opposite corner. A control scheme is designed to enable the agent to perform the physical moves to be simulated. Dana Cremer, Department of Mathematical Sciences, Indiana University South Bend. Exploded views are an illustration technique where an object is partitioned into several segments. These segments are displaced to reveal otherwise hidden detail. Our approach employs a force-based model: the volume is divided into a part configuration controlled by a number of forces and constraints. Evolutionary Design addresses the issue of automatic design of buildable structures and objects with the use of Evolutionary Computation. This field has been growing along with the availability of more and more powerful computers. Major achievements in this field range from evolved creatures[14, 12, 2] to the design of satellite antennas that were actually launched in space  and various designs of everyday objects (e.g. chairs) and/or structures[1, 9, 7, 13] (e.g. brigdes, walls, etc.). 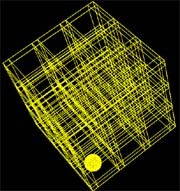 This paper describes the modification of a rigid body physics engine to simulate an elastically deformable object cloth. Cloth is approximated as a grid of rigid body components connected by virtual damped-springs. 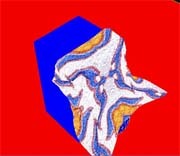 The motion of the cloth is simulated, by the physics engine, using discrete integration of the laws of dynamics governing the behavior of these rigid bodies. The goal of this work is to describe a prototypical system for more natural, non-invasive, interaction techniques. These interactions are analyzed in real-time, and are used to drive the user interface to a billiards simulation. This product addresses the learning needs and competencies from the Junior floor hand right up to operator level. For this product, Terris-Hill is using a first person perspective in a 3D environment, which gives the learner an immersive hands-on experience during training. Airside Simudrive by Paul van Dinther is a training/testing simulator for issuing Stage1 and Stage 2 airside drivers licenses. The simulator simulates an airport environment and tests the drives knowledge of the rules and procedures on the airside. The simulator is also used for specific vehicle operations such as Catering Trucks, conveyor belts and aircraft pushback training. Whether you are looking to use CAD data to build interactive electronic training manuals, innovative marketing communication materials or create real time simulations and games, Deep Creator will fit seamlessly into your working environment and help to optimize your interactive 3D content creation workflow. Virtual Reality Chat (VRC) is a 3D chat application supporting the Internet Relay Chat (IRC) protocol. In addition it supports an own simple chat protocol, too. VRC can be used in 'Walk-Through' or networked mode. In Walk- Through mode, you can enjoy the virtual reality and chat with others using IRC protocol. Haptics refers to technology which stimulates the user's sense of touch. Users are able to literally touch and feel characteristics about computer generated objects such as texture, roughness, viscosity, elasticity, and many other characteristics. The human tactile and kinesthetic senses are stimulated through computer controlled forces which convey to the user a sense of natural feel about a virtual or remote environment. RobotRace is a simulation environment using the theme of a recent contest organized by the US Army, in which autonomous all-terrain vehicles had to race in the desert. The user provide the vehicle controls as a DLL conforming to the interface specification. 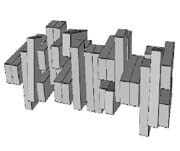 This paper introduces a new representation for assemblies of small Lego-like elements: structures are indirectly encoded as construction plans. This representation shows some interesting properties such as hierarchy, modularity and easy constructibility checking by definition. Together with this representation, efficient GP operators are introduced that allow efficient and fast evolution, as witnessed by the results on two construction problems that demonstrate that the proposed approach is able to achieve both compactness and reusability of evolved components. Project Mako is a venture undertaken by the University of Western Australia to develop an Autonomous Underwater Vehicle (AUV) for entry into international underwater competitions. The project commenced in early 2004 and sought to begin development on mechanical, control, sonar, navigation, vision and communication systems for the vehicle.